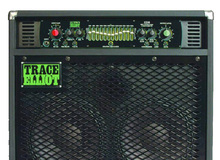 Tech21 presents the VT Bass 500, a 500-watt bass amp head based on a fully analog SansAmp preamp and class D poweramp. EBS has released its Reidmar 750 bass amp head, described as the "big brother" of the Reidmar line. EBS introduces at Musikmesse the big brother in the Reidmar bass amp series, a 750W head.